Cupcake baker is probably the last career you'd imagine for Chip Brown. A towering 6 feet 5 inches, Brown has the physique of a football star--and the culinary sensibility of a pastry chef. Or your elderly aunt. 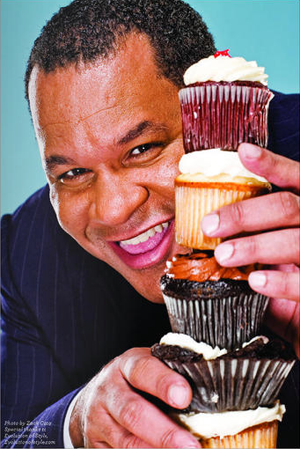 A New York City native, Brown baked cakes for co-workers and for the catering business he started while working in politics, medicine, programming and web start-ups. That is, until he finally decided to quit his day job and start his own bakery. For a man from a world unconnected to cupcakes, William Brown sure throws around pantry parlance like it ain't no thang. The competitive world of Los Angeles confections has a sweet new tastemaker to reckon with… Big time. Big. Man. Bakes. May sound like a pretty simple concept, but the delicacies that come of this Big Man taste much more complex. William (Chip) Brown, med-school student turned bona fide scientist in the kitchen, left his dreams of practicing medicine behind for a much bigger craving. He’s since set up shop in downtown LA, with 5 simple yet heavenly cupcake creations so awesome they nearly outshine his 6’ 5” inch linebacker stature behind the counter! While La satisfied her craving for baked goods on the East Coast, I happened to stumble across Big Man Bakes in DTLA. Pictured here are the double chocolate and red velvet mini’s, which by the way, I annihilated by MYSELF. No frills and almost grimy (given its new location), this shop is my new favorite when it comes to cupcake slangin. So, it has been established that I enjoy a good cupcake, amiright? So you can imagine how happy I am to be able to share this blog post with you all. Months ago, during an LA Artwalk, I was lucky enough to try 2 mini cupcakes from Bigs Man Bakes. Even though it was a mini size (not even two bites) I was still very impressed! The red velvet and the carrot were incredibly moist and the frosting was just right! I was told they were not open yet, and that this was a preview.